Nostalgic about those times at the river bank? Use this mosaic art to incorporate your sweet memories into your decor. Sun is always shining, birds are signing, and flowers never wither. 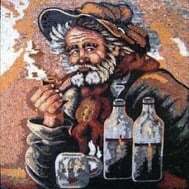 PROs: Handmade mosaic art composed of high-end natural marble tiles that is guaranteed to elevate your space. Mosaicist: Haith D.
CONs: You’ll never stop finding new details here. This stunning mosaic artwork is a perfect addition to your home, garden or retail environment. Our mosaics are made from natural marble and stones, naturally resistant to different environments (dry, moist or wet) and weather conditions (frost, sunlight or extreme heat).